The Russian ruble hit a two-week high Tuesday of 53 against the USD, showing strong signs of recovery after hitting rock bottom one week ago on 'Black Tuesday'. 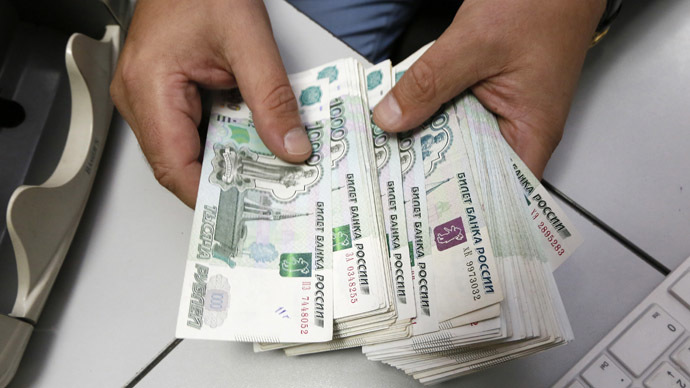 The Central Bank and government have taken swift action to shore up the ailing ruble. The Russian ruble improved to 53 in early day trading, a more than 33 percent increase since just 1 week ago when it hit 80 against the US dollar. The Russian ruble suffered a ‘perfect storm’ last week, and is improving for the third consecutive trading session on the Moscow Exchange Tuesday. By 4:00pm in Moscow, it had weakened to 54.72 against the greenback. The major drop of the ruble coincides with rising oil prices, with the Brent benchmark trading above $60 a barrel after it hit its lowest level since 2009 last week too. The Russian government and the Central Bank of Russia (CBR) have made a significant effort in the last couple of days to stop the ruble’ s free fall. Russia’s five huge oil exporters including Gazprom and Rosneft have been ordered to sell part of their foreign exchange revenues in the next couple of months, Kommersant reports Tuesday. This is expected to add an estimated $1 billion daily to the market, which should serve as strong support for the ruble. On Monday the CBR said it would help Russia’s 28th-largest lender by assets Trust Bank with an estimated $530 million, which followed last week’s announcement of a multibillion dollar rescue package for Russian banking. The CBR also hiked the key interest rate to 17 percent last week, which is also expected to help smooth the currency.